Celebrate with Polka Dot Design all year long! We love all the holiday parties you can have. No matter what you want to celebrate, we have the perfect custom party invitation online. Kick off your year with a New Year's party invitation or send cheer with a New Year's photo card. Next, you can throw a fabulous Valentine's Party or just send love with personalized Valentines. Top sellers include kids mini valentines and Valentine Photo Cards. Throw a Mardi Gras party with a masquerade invitation or go green with a Saint Patrick's Day party invitation. Spring into action with Easter invitations, fun Easter egg hunt invitations or bunny invitations that will help gather everyone to celebrate. Honor America for a patriotic party with one of our Memorial Day party invitations or a 4th of July party invitation. 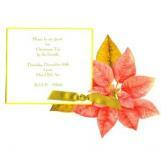 Great pool party invitations and BBQ party invitations will allow you to celebrate all the summer festivities. Spook someone you love with a Halloween party invitation or gather friends for fall festival, harvest hayrides or pumpkin carving parties this fall. Thanksgiving allows you to gather friends and family. We have potluck invitations, pumpkin invitations and turkey invitations that will let you gobble up all the fun of the season. If you want to have a Hanukkah celebration, our menorah invitations would be perfect or send joy with a Hanukkah photo card. End your year with tons of cheer. The party possibilities are endless! We have great holiday party invitations like Christmas cocktail invitations, cookie swap invitations, kids winter party invitations and formal holiday party invitations. Send the best Christmas photo card with a specialty Christmas shape card. The bracket, scallop or ornament shaped photo cards really stand out in the stack of Christmas cards. We also have standard Christmas photo cards in bright colors or chalkboard designs. Top selling Christmas designs include chevron photo cards and glitter photo cards. Polka Dot Design hopes to help you celebrate all the occasions every year. Save up to 25% or free shipping with a Polka Dot Design promo code on custom printed holiday invitations online for all of your family events or family reunions. For more information contact us at service@polkadotdesign.com or toll-free 1-877-816-0884.